The King of Homes For Sale with RV Garage, Parking or Gate in the greater Phoenix Metro area. A funny thing to be King of, a person may ask. However, as a specialty, I am the KING of HOMES FOR SALE with RV GARAGE or RV GATE in the Phoenix metro area. Click to see homes for sale. Many folks move to Arizona with their toys looking for a home. Also younger folks are loving the new modernized, Blue Tooth ready Airstream trailers and other models. Gas prices are more reasonable and Motor Homing or Trailering is less expensive than Motel stays when traveling. Boats are great fun too. A great vacation awaits! How about a Man Cave or Large Workshop Home For Sale in the Phoenix metro? 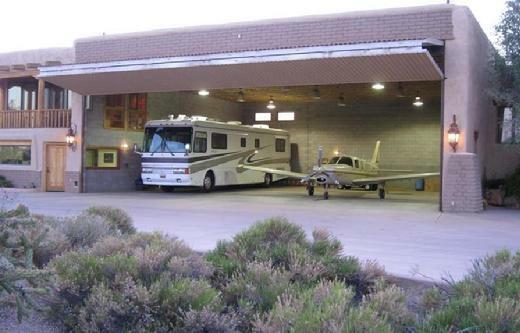 Homes for sale with RV garages in the Phoenix, Arizona metro area or a "man cave" possibly like this home with pictures, prices, details map locations and more in this link with a full page view or see the list that follows. Where do I park my rig? Well the dilema is for a home buyer, where does one park their RV or boat or trailer after disconnecting from the truck. Well, at your home amigo! Ask me the King of the RV Garage or Gate Homes For Sale for all possible homes for sale. I track them and am your Go-To guy! As King I track all homes with RV garages, RV gates, Large Workshops, hangars for additional parking for sale in Arizona. Following is an always up to date list of the latest RV Garage homes for sale in the Phoenix metro area including, Scottsdale, Fountain Hills, Mesa, Peoria, Glendale and more. Note, many of the homes on this list have a full RV garage while some are better described as "RV Parking" or RV covered parking. Also room for boats, workshop or a "Man Cave". As me about RV gate homes for sale too. There are many more of those in our Phoenix metro area. Although many HOAs do not allow a Motor Home parked behind a gate, lowered drop down trailer or boats are allowed in many cases.